Looking for an expert in performance management or analytics? Decision Systems’ provides solutions that dramatically improve productivity (and consequently profitability), both departmentally and organizationally. Need to update managerial or operational reporting? Or improve planning, budgeting and forecasting? Decision Systems has the experience and expertise to help. We’ve served companies covering a wide range of sizes and industry segments. 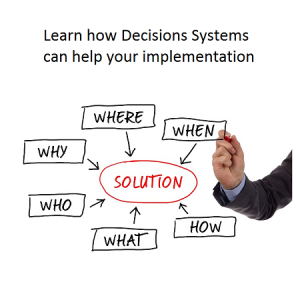 How does Decision Systems help? Decision Systems offers specialized products and services that facilitate more effective decision-making, thus boosting ROI over the long term. We have the tools and solutions to help organizations organize and focus a wide range of financial, marketing and operational data. How is Decision Systems different? The Decision Systems’ process provides you with the appropriate set of tools and services to address your business problem. We’ll select the software tools from a set of suppliers: supporting that software with industry specific expertise. Get the tool that fits, as opposed to being pushed into the tool that is being sold. The Decision Systems team consists of foremost people in their respective fields. We have established expertise in Financial Services, Manufacturing, Technology, Automotive, Food & Beverage, Advertising, Retail and Pharmaceutical. We have both technical skills and the business experience necessary to deliver solutions that will meet the varying needs of our clients.